Spring is here and like the majority of parents with younger children, I spend many days at my local parks. We have so many in this area to choose from and each of them have my kids’ favorite thing: a spiral slide. It’s the first thing they run to and the last thing they ask to go on before we leave. They love zooming down and even walking up the slides. On these park days, the one thing you won’t see is two of them going down together or my going down a slide with them. 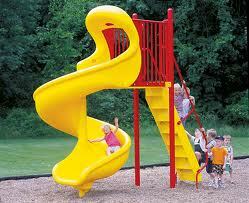 No, it’s not because I’m a “mean mom.” It’s simply because I am aware of the danger of these spiral slides. I probably sound like a worrier, but I know first-hand what can happen on a slide and I am not alone. Twelve years ago, my husband and I took our 14-month-old daughter and my little sister to the park. They were having so much fun playing on the swings, the rickety bridge and even the spiral slide. Because my daughter was little, my sister put Juliana on her lap and slid down. At the bottom, she put Juliana down and immediately, Juliana lifted up her leg and began crying. We assumed she twisted her foot a bit so I comforted her and went home. A couple of hours later, Juliana was still limping and occasionally crying so we took her to the Emergency Room at Signature Healthcare, then called Brockton Hospital. An exam and x-ray showed a fracture! The doctor referred to the break as a “Toddler Fracture;” common amongst kids her age when they step on toys and slide down slides. Although we were waiting at the bottom of the slide and didn’t see it happen, the doctor assumed it happened as my sister and Juliana went down the slide. He speculated that her foot must have gotten caught at some point. We felt so badly for her, but luckily about six weeks later, the foot healed and we were back to playing at the park. I’d like to add to that advice as a seasoned mom of three: if you are worried about your child’s safety while riding a slide, don’t put them on it. Use your instincts and if you think the slide is too high or looks to be a fast slide, offer an alternative structure to play on. It’s just not worth it.